Anyone with YouTube access can search for Paul Potts the first winner of “Britain's Got Talent” and be brought to tears as the unsuspecting looking young man pours out his heart with his amazing operatic voice. 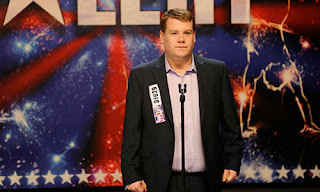 This film version of his journey by director David Frankel with a screenplay by Justin Zackham makes Potts more appealing as portrayed by Tony award winner James Corden. It's a nice inspiring Hollywoodized movie that hits all the right buttons and makes you feel good afterwards. Paul (James Corden) had always loved opera. He was also always bullied at school and as an adult even losing a few teeth in one altercation. His father Roland (Colm Meaney) wants him to give up the music and work at the factory like everyone else in their small town. His mother Yvonne (Julie Waters) is more supportive. Paul works at a mobile phone store with Braddon (MacKenzie Crook) who tells him to try out at a local talent show so he can earn money to go to opera school in Venice. His new girlfriend Julz (Alexandra Roach) who he met online lives in a neighboring town and doesn't quite believe him when he calls her from Italy. Paul's biggest problem is confidence and he blows his chances when he chokes before his idol Luciano Pavarotti. He later gets a chance to play the lead in a local production of Aida but he's struck with appendicitis and a tumor on his thyroid. Shortly after getting his voice back, he's struck by a car. He perseveres throughout by the love of his now wife Julz who never stops believing in him and despite the the disapproval of his father. The soundtrack was scored by Theodore Shapiro and was nominated for a Golden Globe for Best Original Song in a motion picture. (Sweeter Than Fiction by Taylor Swift). Pott's own vocals were used in the singing parts. The journey to perform and be judged by Simon Cowell on the televised talent show makes a nice sweet story. It looks like the YouTube video was merged with the movie. Lots of liberties were taken in this film. So what if they changed him to being Welsh even though he was really from Bristol. So what if they took out his siblings making him an only child. It's a Billy Elliot sort of tale where a poor sod finds creative rewards by his sheer talent and gumption. Not a dry eye in the house.